On July 18th, the Board of East Bay Community Energy (EBCE), Alameda County’s new Community Choice energy program, adopted a groundbreaking plan for local clean energy development in the East Bay. The Local Development Business Plan (LDBP), as it is called, is a roadmap for providing local clean energy benefits in the East Bay by investing in the development of local renewable energy resources. The Plan spells out actions and strategies for promoting local clean energy such as solar, wind, energy efficiency, and energy storage projects. These projects help address the environmental, economic, and social justice needs of the East Bay community. 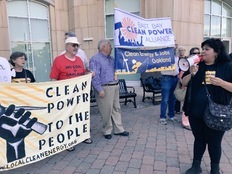 Many community leaders gathered before the July 18 EBCE Board meeting for a “Clean Power to the People” rally in support of the Plan’s adoption. The rally was an important reminder of everything the community has been fighting for in a community energy program, and how far that fight has brought us. Jing Jing He, of the Asian Pacific Environmental Network, and Rev. Ken Chambers, Pastor of Westside Missionary Baptist Church in Oakland, emphasized the implementation of the Local Development Business Plan is essential for creating opportunities for low-income communities traditionally shut out of the clean energy economy. Clean energy is a right, not a privilege! The EBCE Board approved the Plan unanimously after thanking the consulting team and the community for all their hard work in creating a truly groundbreaking roadmap for local clean energy development. The Plan proposes a number of early action items in the next two years and a number of strategies and programs for longer-term development of local energy resources. In addition, EBCE is utilizing outside grants to support solar and storage projects on critical facilities such as fire stations and hospitals. The Board directed the EBCE CEO, Nick Chaset, to begin immediate implementation of the early action items identified in the Plan. These items include programs for demand response, energy efficiency, building and transportation electrification, a feed-in-tariff for municipal buildings, community shared solar, and more. They represent 45MW - 60MWs of new renewable energy development in Alameda County over the next couple of years. The Plan is a first for Community Choice energy programs in California, and provides a model of how Community Choice programs can address the pressing needs of their communities. By implementing the Local Development Business Plan, EBCE will set a new standard for addressing climate change by empowering communities and strengthening community resilience. With this achievement in place, the East Bay Clean Power Alliance is organizing to further engage the community in these projects and to call for millions of dollars of investments in new program development from the projected $43 million in net revenues in the first year of EBCE operations. East Bay Clean Power Alliance will follow up this victory, by ensuring adequate staffing and funding for implementing these programs in our community. In October 2016, East Bay Clean Power Alliance, an Alameda County-wide alliance, called for a ground-breaking program that would prioritize equitable development of local renewable resources, creating union- and family-sustaining jobs, stimulating local businesses, and include direct community representation in the governance of the program. East Bay Clean Power Alliance called for a business plan to study where and how East Bay Community Energy can invest and incentivize local renewable energy development projects. Alameda Board of Supervisors agreed by allocating $500,000 towards a Local Development Business Plan study. Local Development Business Plan agenda item and document for July 18, 2018 can be found here on the East Bay Community Energy’s website. Please check out EBCE public meetings website for agendas, times and location.